Join us in the Jameson Gallery, 115 Friedl on Feb. 22nd at 5pm for a Talk with Margaret Regan on Undocumented Immigrants in America. Margaret Regan is the author of two prizewinning books on immigration. Her work has been published in the Washington Post, Al Jazeera English, Utne Reader. Sojourners, Newsday, Black + White, Photovision and in many regional and local publications. She has appeared on NPR, C-Span Book TV, WHYY Philadelphia, KPFK Los Angeles, Pacifica and many other radio stations, and she gave a TEDx talk in Phoenix. Most recently, in March 2016, Margaret did a solo half-hour Q&A appearance on Book TV’s “Open Phones,” program, taking questions about immigration from viewers around the nation. She’s a regular speaker at the Tucson Festival of Books. Her books have been adopted in many university classrooms, including the University of California Davis, Loyola University Chicago, Franklin Marshall College, James Madison University, Butler University, Northern Arizona University, Arizona State University and the University of Arizona. 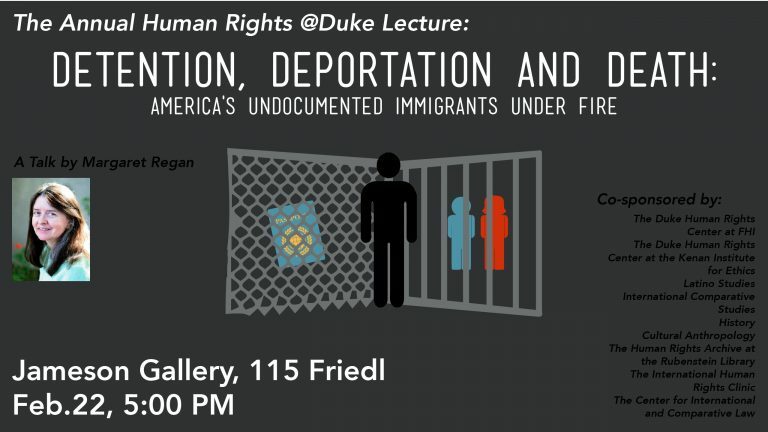 This event is co-sponsored by: The Duke Human Rights Center at FHI, The Duke Human Rights Center at the Kenan Institute for Ethics, Latino Studies, International Comparative Studies, History, Cultural Anthropology, The Human Rights Archive at the Rubenstein Library, The International Human Rights Clinic, and The Center for International and Comparative Law. The Center for International and Comparative Law.